May 23rd is National Taffy Day! 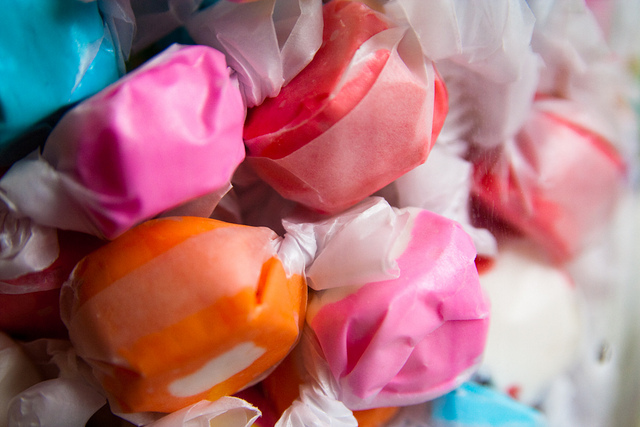 Salt water taffy was “invented” in Atlantic City in 1883. Modern technology allows confectioners to produce 1,000 pieces of taffy a minute. In one hour enough pieces of taffy are made to cover one third of the length of Atlantic City (about 1.3 miles). The three most popular taffy flavors sold by Sweet Candy Company are peppermint, cinnamon and chocolate. America celebrates National Taffy Day May 23rd. 1922 Thomas Edison patented a method for making metal foils. 1960 R.I.P. Georges Claude. A French engineer, he invented the neon light, commonly used for signs. 1968‘Yummy, Yummy, Yummy’ by the Ohio Express is #1 on the charts. 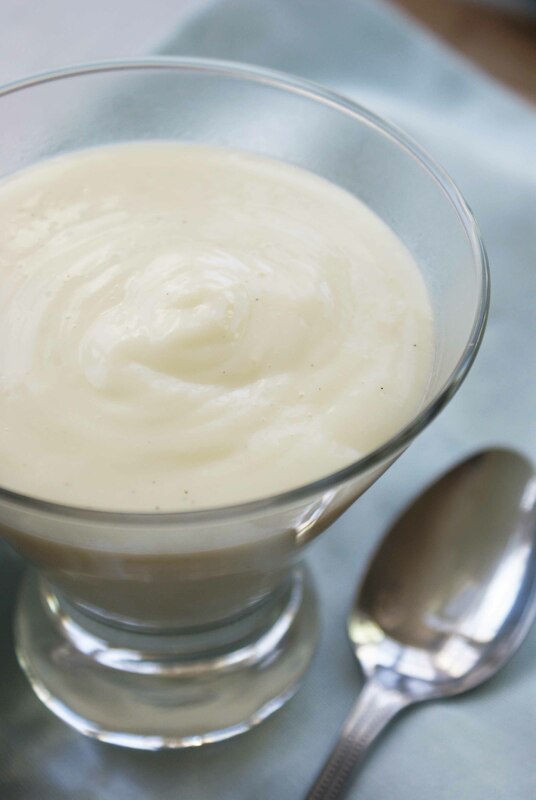 May 22nd is National Vanilla Pudding Day! 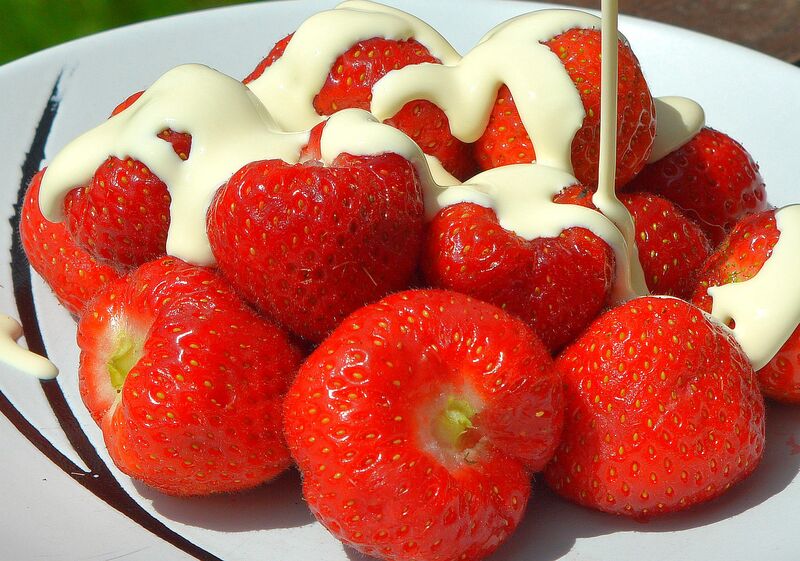 May 21st is National Strawberries & Cream Day! 1923 Delmonico’s Restaurant closed its doors, a victim of Prohibition. (Some sources list October 4, 1918). 1987 Archie Fairley Carr died. An American biologist and authority on turtles. His extensive studies and conservation efforts helped to increase turtle populations around the world. 2009 After months of numerous mechanical failures, a new recycling system was activated on the international space station. The new system recycles astronauts urine and sweat into drinking water. 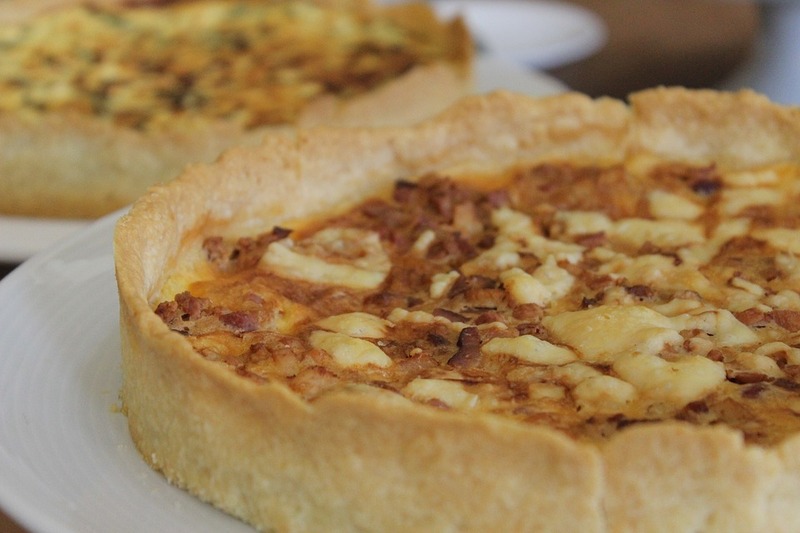 May 20th is National Quiche Lorraine Day! Quiche is a savoury , custard pie usually filled with cheese, meat, seafood or vegetables. The word “quiche” come from French, which originally borrowed the word from Lorraine Franconian “Küeche” (meaning “cake”). Quiche originated in Germany, although today it is known as a classic French dish. The original recipe for quiche lorraine was an open pie with a filling of custard with smoked bacon or lardons and cheese was not added till later . The world largest quiche was made by Chef Alain Marcotullio. It based for over 18 hours and fed more than 125 people. 1506 Christopher Columbus, explorer, died. 1799 Honore de Balzac Born. French author. Balzac would lock himself away during creative bursts, drinking coffee and eating only fruit and eggs. When he finally took a break, he was known to consume huge quantities of food. One report recalls that at the Véry restaurant he ate “a hundred Ostend oysters, twelve cutlets of salt-meadow mutton, a duck with turnips, two partridges and a Normandy sole,” not to mention the desserts, fruit and liqueurs he also consumed. 1810 On this day Dolly Madison, wife of president James Madison, supposedly served the first ice cream at the White House, for a reception. 1862 President Lincoln signed the Homestead Act into law. It opened millions of acres Western land to settlers. 1875 The International Bureau of Weights and Measures was created. 1884 L. Blue patented a hand corn sheller. 1913 William Hewlett was born. Founder with David Packard of Hewlett Packard Company. Before they became famous for computers and printers etc., some of their early inventions were an automatic urinal flusher and a weight loss shock machine! 1993 The last episode of ‘Cheers’ aired on TV. 2005 Governor Jeb Bush signed a bill making the orange the official State Fruit of Florida. The orange blossom and orange juice have been previously declared the official state flower and official state beverage. 2009Hot Dog Wars: Sara Lee (Ball Park Franks) sued Kraft Foods (Oscar Mayer Jumbo Beef Franks) over claims that Oscar Mayer franks are better than Ball Park Franks. May 19th National Devil’s Food Cake Day! Devil’s food cake is considered a counterpart to the white or yellow angel food cake. 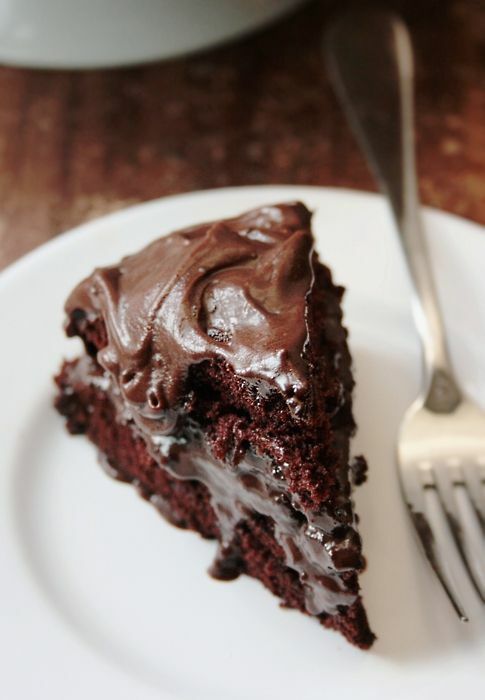 Devil’s food cake is generally more moist and airy than other chocolate cakes, and often uses cocoa as opposed to chocolate for the flavor as well as coffee. Devil’s food cake was introduced in the United States in the early 20th century with the recipe in print as early as 1905. A similar cake, the red velvet cake, is closely linked to a devil’s food cake, and in some turn of the century cookbooks the two names may have been interchangeable. Devil’s food cake incorporates butter (or a substitute), egg whites, flour (while some chocolate cakes are flourless) and less egg than other chocolate cakes. 1962 Marilyn Monroe sings ‘Happy Birthday’ at a birthday salute to President John F. Kennedy at Madison Square Garden. 2006 Nicole Belinda Franzen Reese was chosen as the 59th ‘Alice in Dairyland’ by the Wisconsin Dept. of Agriculture, Trade and Consumer Protection. She will be the spokesperson for the states agriculture industry. 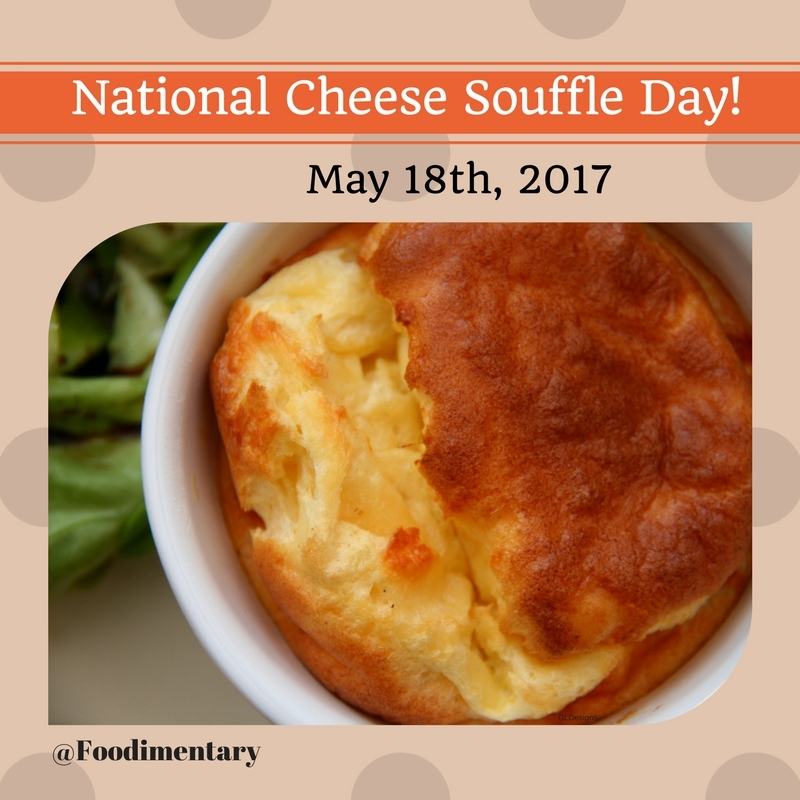 May 18th is National Cheese Souffle Day! Happy National Cheese Soufflé Day! A souffle is essentially a simple white sauce enriched with egg yolk. Stiff egg whites are folded right into the mixture. At this point, you can add whatever flavor you like: cheese, vegetables, chocolate or fruit. The secret to a great souffle is to beat the egg whites into stiff white peak consistency and to fold them carefully into the sauce to keep as much air in the mixture as possible. Savory souffles are often too light for a main course, but the addition of chicken and spinach here bolsters this into a substantial main course. When you break into it with your fork, the seductive aroma of cheese, chicken and spinach pours out. It’s elegant, airy and fluffy. The secret to success is making sure your timing is just right. So plan ahead carefully; figure out what you will be serving first — such as a salad or soup — and time the souffle to go into the oven as you sit down for your first course. You can wait for a souffle, but a souffle waits for no one. You don’t want to serve a deflated souffle. 1808 Elijah Craig died. A Baptist minister in Kentucky, he is an important figure in the invention of Bourbon Whiskey. He ran a paper mill and started a distillery in 1789. Legend credits him with being the first to use new charred oak barrels to age corn whiskey, which is a key step in making bourbon. 1935 Allan Burns was born. Screenwriter and producer, co-creator of The Mary Tyler Moore Show and Rhoda. He also created the character Captain Horatio Magellan Crunch for Quaker Oats ‘Cap’n Crunch’ breakfast cereal. 1995 Elisha Cook Jr. died. A well known character actor in films and TV. I remember him mainly in his role as Wilmer, in the ‘Maltese Falcon’. 2001 Hong Kong ordered more than 1 million chickens and other poultry killed to halt the spread of another bird flu epidemic.